Ahmed Ansari was born and raised in Mumbai. While in college, he worked doing textile, jewelry and commercial design including Arabic calligraphy. Mr. Ansari left India and worked for nine years as a graphic designer and art director in advertising agencies in the United Arab Emirates and Saudi Arabia. In 1990, he immigrated to the U.S. when he was hired by an international advertising agency in Boulder, Colorado. 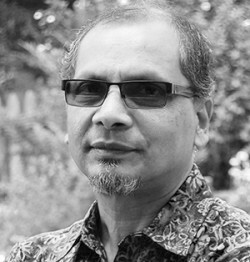 For more than 30 years, Mr. Ansari’s commercial work focused on digital media and web design. In the last few years he has focused his attention on his life-long love of Arabic calligraphy and fine art painting. Mr. Ansari resides in Chantilly, Virginia. Mr. Ansari can be reached at ansari@ansarifineart.com.